The V&A has been over-run by school children hopped up on half-term holiday fever. At first, we assumed the long lines of mini-human-caterpillars blocking the corridors and taking over the toilets had taken a wrong turn in the tunnel on their way to the dinosaur museum. 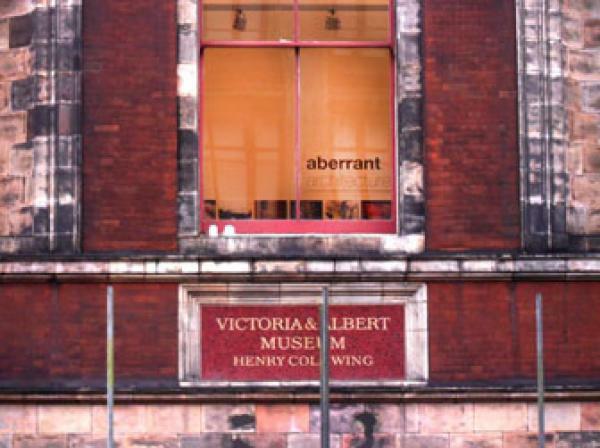 We only keep a few old clothes and some even older earthenware on the east side of Exhibition Road. But to our surprise, their little faces lit up at the sight of the 15th century blue and white Chinese porcelain exhibited in the Far Eastern Collection. Ten-year-old children admiring a Ming vase…what’s the world coming to? In my day, the reconstructed façade of a medieval town house in the V&A’s new Renaissance and Medieval gallery would have been no match for a Tyrannosaurus Rex. Even the nerdy Science Museum has a Van de Graff generator. Kids grow up so fast these days! In an unrelated incident, the Government paid a visit to the studio on Tuesday morning. Gordon Brown’s serious men and women came dressed in serious suits and identified themselves as the ‘DSCF’. It turns out that this almost secretive acronym is short for the slightly better known Department for Children, Schools and Families, the central government department headed by Ed Balls and the senior civil servant David Bell. The representatives of Brown, Bell and Balls visited the studio to find out what we are up to from an educational point of view. By happy coincidence, their fact-finding mission coincided with a tutorial we were giving to some of our students from London Met. Although there was no obvious link between our lecture on flexible working and the DCSF’s stated goal to make England ‘the best place in the world for children and young people to grow up’, needless to say, the representatives from the DCSF were very attentive in class, they had a good grasp of our back catalogue of work, and they demonstrated promising comprehension of our flexible working research; B plusses all around. One eager bloke from the DCSF even put his hand up to ask a question. Letting him down gently, we told him we haven’t designed any schools as yet, but we would certainly like to do so in the future. At the same time, we edged our bodies towards the large model for a home/school that was sitting on the table in the middle of the studio. The model is being constructed by one of our London Met students. Her character study is a disgruntled Chatham mother who feels forced into converting her home into a school by the failing state school system. It is unbelievable. Every lunchtime, the lecture theatre and all of the meeting rooms in the Sackler Centre have been occupied by a talk, a presentation or some committee action group, which can mean only one thing for us…leftover buffet food! In the morning, we notice the tables being assembled in the corridor in front of the residency studios. Like hawks, we watch the ticketed attendees spill out of the lecture theatre. We wait for them to nibble on the cucumber sandwiches, sip the tea and coffee and pick at the cakes and biscuits, before we hungry artists – perched behind our glass cages – swoop in to pick the bones of the buffet. The presentation on ‘World Cities: New York’ had some particularly tasty bacon and avocado sandwiches. Of course, the experience is all part of our research into flexible working. A plate of leftover sandwiches placed in the office breakout room after a meeting is one of the many hidden remunerative benefits denied to the lonely home worker. It’s practically a free lunch. But never fear when Gordon Wu is…erm…near. One of the meeting rooms was reserved for the ‘Exhibition Road project’. 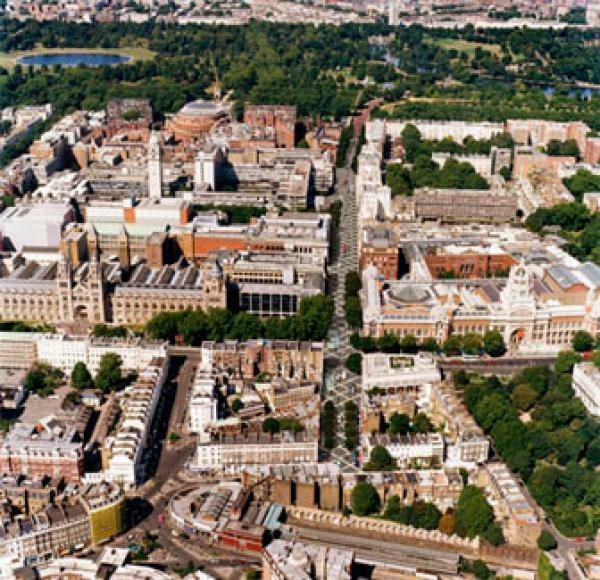 Exhibition Road, for those of you unfamiliar with the street layout in Albertopolis, runs in between the Natural History Museum, the Science Museum and the V&A, and goes up past the Royal Albert Hall. 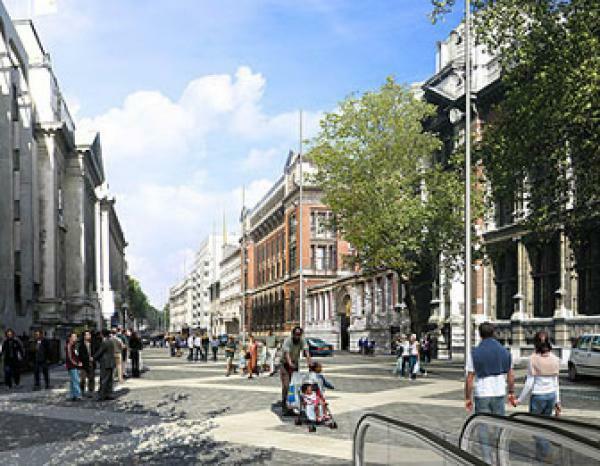 And for those of you who don’t keep track of planned nationwide road works, the local council plans to turn Exhibition Road into a ‘shared space’. This means that every road sign and road marking will be stripped away, the pavement will disappear, the barriers and railings will be removed, and cars, bikes and pedestrians will have to share the same space under the basic premise that it will force people to pay more attention to other users of the road. The idea sounds good in theory, but in reality, it may take the iPod generation a few rolls on the bonnet before the headphones start to come off. But whatever eventually happens, on Wednesday we had a good view of the launch party happening across the street from the window in our walk-in wardrobe. So to mark the occasion, we brewed the kettle and shuffled into the studio closet to watch the team of construction workers in fluorescent jackets come out for the ceremonial breaking of the ground. Suddenly the air turned a bit…umm…peculiar. Okay, we were standing in a confined space with our pinkies inadvertently raised, sipping strawberry and cranberry fruit tea out of a cup and saucer, but we had just come from the World Cities: New York buffet. That was our excuse, but that doesn’t account for the eccentric behaviour on the street outside. The fluorescent builders weren’t huddled in a group drinking mugs of PG Tips. Nor were they wolf-whistling passers by or showing off unsightly cracks. On the contrary, the toned and muscular workmen began flipping and twirling like choreographed lollipop men leaping around in the background of a road safety advert. Now, we’ve been on building sites before as part of our architectural schooling, and we can tell you that this is not standard behaviour. In fact, the only explanation we could think of was that the organisers of the Exhibition Road project had hired a professional troupe of dancers to pose as builders for the opening press junket. Either that or the construction workers had retrained as part of a Government-led employment drive during the recent downturn. But I know which one I have my money on. On Friday night, we finally completed our studio makeover, just in time for our first open studio weekend. Valentine’s Day, Chinese New Year, the cold weather and the usual weekend tube havoc couldn’t stop our faithful visitors coming in to talk to us on Saturday and Sunday. The lure of our questionnaire on flexible working and a free copy of a short story from our ‘Love Stories of Recession’ project evidently proved too much to resist. The tea and biscuits was also an added sweetener (the pack of chocolate hob-nobs disappeared before the chocolate digestives were even opened). The cold weather actually helped us for once. Since there are no meetings on the weekends, we couldn’t appropriate any milk from the buffet. 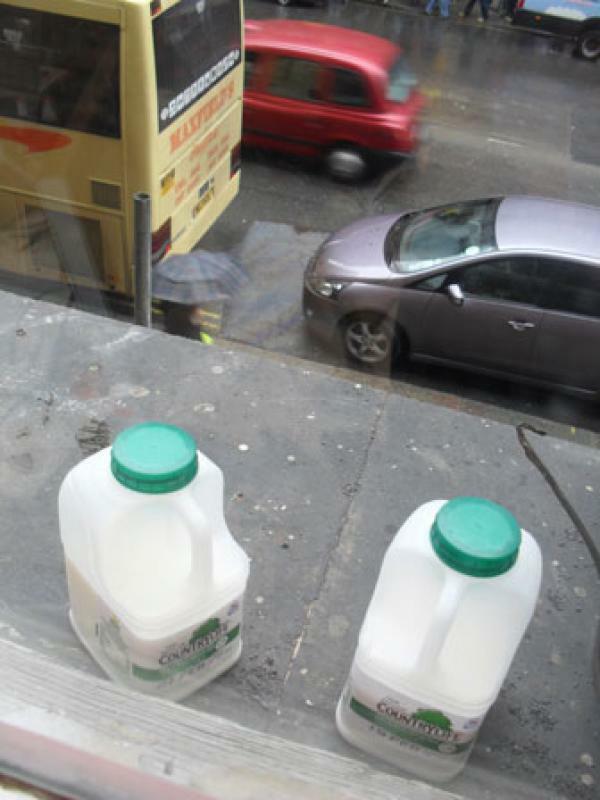 Therefore, we had to resort to storing a pint of milk outside of the window. Last week we all overdosed on weaving facts and weaving-related paraphernalia. It was irresponsible and excessive, but what the heck, we only live once…except we’re paying for it now. We’ve come down from the Scottish Highlands with a mean case of the shakes and only a few off-cuts of Harris Tweed to keep us warm. So to ease the transition, the company doctor has advised us against a complete weaving withdrawal. 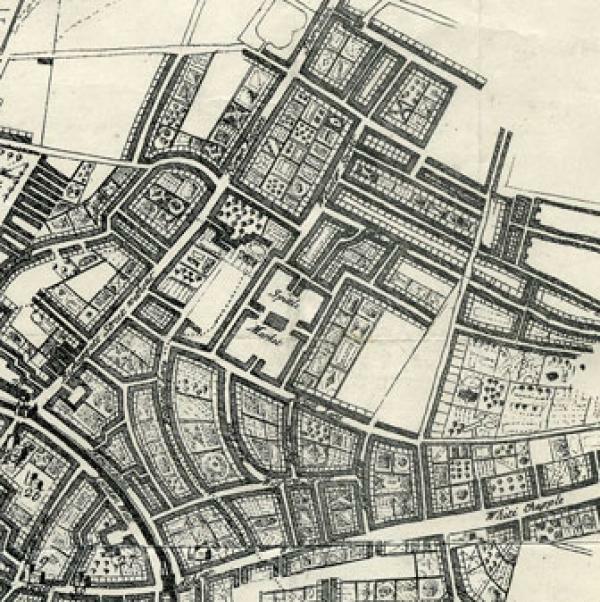 In the 17th and 18th centuries, the nation’s silk industry existed within a square mile of Spitalfields market. The wholesale merchants sold the raw silk in the same streets as the silk throwers turned the raw material into thread, the weavers wove the thread into silk, and the silk mercers marketed the finished product to the end consumer. Each element of the silk supply chain operated independently of the other and independent of a central company or employer. Silk production centred on the silk weaver’s home. The dual-function houses would be split into a residential dwelling on the lower floors and a workshop in the attic. The floorboards between the attic and the living quarters would be packed with silk waste to act as insulation against the noise of the looms. Now there’s a history lesson for ever teenage boy being nagged to tidy up their attic bedroom: stuff any unwashed linen and used tissue piles beneath the floorboards and in one fell swoop, the room is clean, the parental heating bill is lowered and the nightly sound of the squeaking bed springs will be muffled forever. Everybody’s happy!